Pipérade (French) or piperrada (Spanish) is a French Basque dish made from green bell pepper, garlic, onion and tomato, sautéd together and seasoned with red espelette pepper. The word derives from piper, the Basque word for pepper. The colors—red, white and green—are those of the Basque flag (said to be a coincidence). Basque Country straddles the border between France and Spain on the Atlantic coast, Pyrénées-Atlantiques north and south of the Pyrenees Mountains. The area has a rich culinary heritage, including some 40 Michelin-starred restaurants and a sheep cheese, Ossau-Iraty, named best cheese in the world at the World Cheese Championships in 2011. Pipérade is a dish from the Northern Basque Country (French Basque Country), which lies entirely within France and known as Pays Basque Français in French. Pipérade is related to the Provençal ratatouille, which adds zucchini and eggplant to the mix. Both are colorful and versatile dishes that can be enjoyed any time of the day (and are a delicious way to add to your daily vegetable servings). 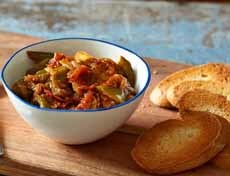 While many of these applications may not be traditional Basque, they show the flexibility of piperade. *In French Basque cuisine, piment d’espelette with ham is often served over braised chicken. When bell peppers are on sale, we load up and make a batch of pipérade (it can be frozen). We’re flexible on the color of the bell peppers (in fact, we prefer a mix of colors ). While waiting for summer tomatoes (and after they’re gone), we use whole canned San Marzano† tomatoes instead of the bland plum tomatoes in the market. Drain them, but save the juice and drink it, plain or with a splash of gin. We adapted this recipe from one by Chef Aida Mollenkamp. She peels the tomatoes. We’re lazy and often skip this step (and usually use use the peeled, canned San Marzano tomatoes, anyway). Pipérade crostini (here’s the recipe from The New York Times, and another recipe for piperade with Arctic char). 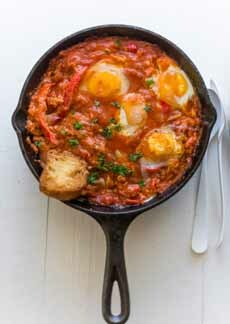 Eggs poached in pipérade, shakshouka-style (here’s the recipe from Au Petit Gout). 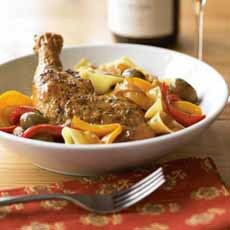 Chicken with pipérade, a basque classic (here’s the recipe Williams-Sonoma). 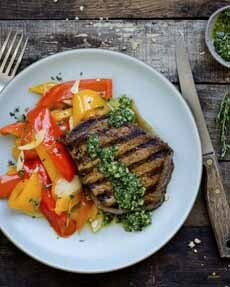 Sirloin with pipérade and arugula pesto (photo from Sun Basket meal delivery service). 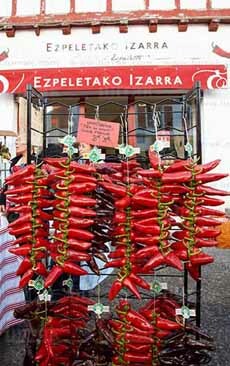 Fresh espelette peppers in the marketplace (photo courtesy Lurrak). 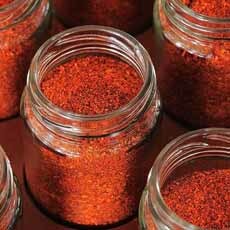 Ground espelette pepper, used in recipes (photo courtesy La Maison du Piment). †The San Marzano is an heirloom variety of plum tomato, originally planted in the town of the same name at the base of Mount Vesuvius, near Naples. The volcanic soil and sunny climate grow tomatoes that are among the most sought-after on earth, with remarkable, sweet, intense tomato flavor. The canned variety are also delicious. ‡Bayonne ham is a cured ham from the French Basque country. If you can’t find it, substitute prosciutto or other ham. 1. PEEL the fresh tomatoes. Bring a large saucepan of water to a boil over high heat. Prepare an ice water bath by filling a medium bowl halfway with ice and water. Using the tip of a knife, remove the stem and cut a shallow X-shape into the bottom of each tomato. Place the tomatoes in the boiling water and blanch until the skin just starts to pucker and loosen, about 10 seconds. Drain and immediately immerse the tomatoes in the ice water bath. Using a small knife, peel the loosened skin and cut each tomato in half. With a small spoon, scrape out any seeds, then core and coarsely chop the remaining flesh. Set aside. 2. PLACE a large Dutch oven or other heavy-bottomed pot with a tigh-fitting lid over medium heat, and add 1 tablespoon of the oil. When the oil shimmers, add the ham and cook, stirring occasionally, until it’s golden brown, about 8 minutes. Using a slotted spoon, transfer the ham to a plate and set aside. 3. RETURN the pan to the heat, add the remaining 2 teaspoons of oil, and, once heated, add the onion and garlic. Cook, stirring a few times, until soft and beginning to color, about 8 minutes. Stir in the herbs and bell pepper slices and season well with salt. Cover and cook, stirring a few times, until the peppers are slightly softened, about 10 minutes. 4. STIR in the diced tomatoes, browned ham, and piment d’Espelette, and season with salt to taste. Cook uncovered until the mixture melds and the juices have slightly thickened, about 10 minutes. Remove the bay leaf and serve. The espelette pepper, called piment d’espelette in French and ezpeletako biperra in Basque, is a variety of species Capsicum annuum that is cultivated in the French commune of Espelette in the Northern Basque Country (Pays Basque Français). Chiles, which are native to Central and South America, were brought to France in the 16th century. It is believed that the chiles were introduced into the Basque Nive Valley in 1523 by Gonzalo Percaztegi, a navigator who voyaged with Christopher Columbus (who brought chiles to Spain in 1494). It became popular as a condiment and is now a staple of Basque cuisine, where it has gradually replaced black pepper. This pepper has only a maximum of 4,000 SHUs on the Scoville Scale and is therefore considered only mildly hot—at the level of cayenne and Louisiana hot sauce. Espelette pepper can be purchased as fresh or dried whole peppers (photo #5), as ground pepper (photo #6), as purée in jars or pickled in jars. For fresh espelette, look for non-AOC espelette peppers grown in California. Growing in French soil, its unique qualities have earned it AOC and APO classifications. An annual pepper festival organized by Confrérie du Piment d’Espelette, held the last weekend in October since 1968, attracts some 20,000 tourists [source]. If you can’t find it, substitute hot paprika or cayenne. See the different types of chiles in our Chile Glossary.